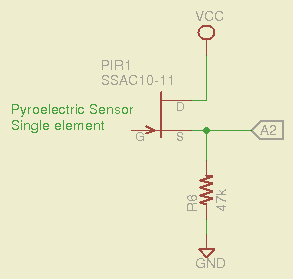 For my present purpose, however, a bare single-element pyroelectric detector will work just fine: the general idea is to detect things out there in front, not make decisions about what’s going on. 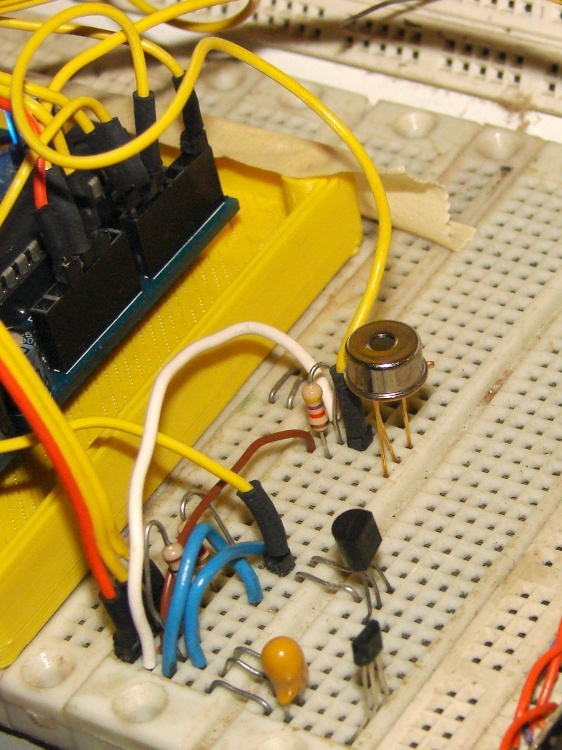 Under normal circumstances, where you want decisions, you’d use a module (from, say, Sparkfun) with a passive IR sensor in front of some circuitry that conditions the output and produces yes-no detections. LadyAda has a good description of the workings thereof & interfacings thereto, including a link to the BISS0001 analog chip that does most of the heavy lifting in low-end PIR modules. The SSAC10-11 (if, indeed, that’s what it is) reports the voltage difference between a reference element shielded within the can and an active element exposed to incoming IR. The DC bias for that lashup produces 650 mV on the 47 kΩ source resistor (about 14 μA) and the internal arrangement produces a lower voltage (and thus current) when the exposed element sees a warmer object, which isn’t quite what I expected. Warming the can by direct finger contact produces an increasing voltage, due to heating the reference element and leaving the sensing element (relatively) cool, at least until conduction equalizes the elements. In real life, you’d want a reset button, or some code that gradually drifts the extrema toward the running average of the input, so they’re not stuck forever. Updating the displays every 100 ms seems about right. It’s crazy sensitive to anything within its field of view; sitting down two feet away is good for a few counts and a palm at 30 cm gives you 15 counts. As expected, the increases and decreases fade away exponentially over the course of a few tens of seconds. This entry was posted on 2012-12-13, 07:35 and is filed under Electronics Workbench, Software. You can follow any responses to this entry through RSS 2.0. Both comments and pings are currently closed.